Phillies pitcher Jerad Eickhoff got the early hook against the Braves on Friday. Make it nine losses in a row — and six consecutive losing seasons — for the Phillies, who are playing out the string for one more weekend before packing their bags and going their separate ways. But don't tell Jerad Eickhoff that Friday night didn't mean anything. 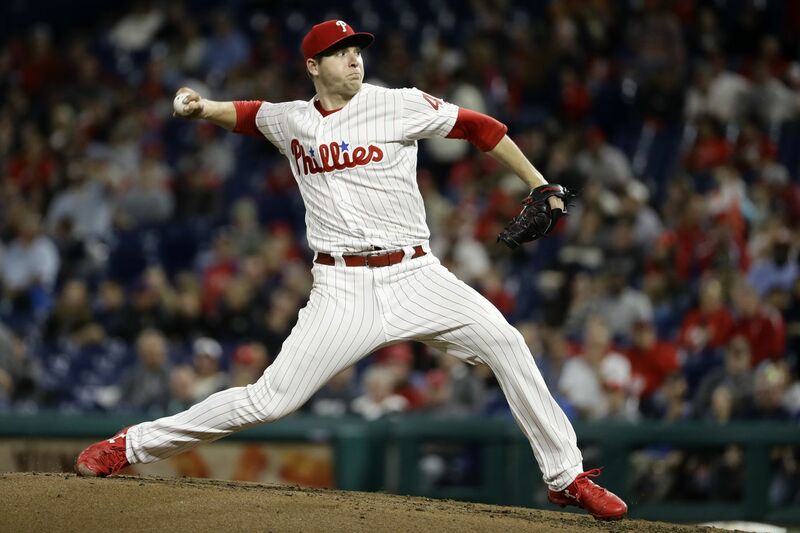 Making his first start in 13 months after injuries waylaid his career, Eickhoff was emotional on the mound and especially in the clubhouse following a 10-2 loss to the Atlanta Braves before an announced crowd of 24,306 at Citizens Bank Park. "It was a pretty special day all around," said Eickhoff, who teared up and had to compose himself for several seconds before answering questions. "Just the year, the trials, just everything, it really culminated walking off. I couldn't really contain it in the dugout." Eickhoff couldn't explain his performance either. Never mind that he had pitched all of two innings, both out of the bullpen, since the Phillies reinstated him from the disabled list three weeks ago. His curveball couldn't have been any sharper en route to racking up seven consecutive strikeouts at one point, including Ronald Acuna Jr., Ender Inciarte, Freddie Freeman and Nick Markakis — the first four hitters in the Braves' lineup. Before the game, manager Gabe Kapler said Eickhoff would "have some rope." As it turns out, that meant about three innings. So, when Eickhoff allowed back-to-back one-out hits in the fourth, including a solo homer by Johan Camargo, Kapler strode to the mound to remove the big right-hander from the game after 56 pitches, his most since an 89-pitch rehab start on Aug. 30 for triple-A Lehigh Valley. "It would have been irresponsible to push him significantly beyond what he was ready for," Kapler said. "Anything beyond three innings was real rope for Eickhoff. I let him know that when I came out to get him. He understands." Eickhoff was charged with two runs on five hits in 3 1/3 walk-free innings, most of which he called "an out-of-body experience." "To be able to go out here and get a chance and have a game for me to start was everything," he said. "That's who I am, that's who I strive to be, and to be given that gift to go out there just meant the world to me." The Phillies nevertheless continued their precipitous late-season slide. By falling for the 82nd time, they clinched a losing record, a stunning development considering they were 15 games above .500 as recently as Aug. 7. They have been particularly awful since their playoff chances were extinguished last Sunday. In five games since then, they have been outscored by a 49-9 margin. Kapler spent most of the afternoon in meetings with members of the front office. He described the conversation as "just normal end-of-the-year meetings." But given the events of the past seven weeks, there surely was plenty to talk about. And after the game, Kapler was emphatic that the Phillies haven't quit on the season, regardless of the recent results. Among other things, he highlighted Rhys Hoskins diving for a ball in left field and hitting a homer in the ninth inning as evidence that the Phillies have been playing hard. "There wasn't an ounce of quit," Kapler said. "We weren't good enough. We didn't play well enough to win tonight's baseball game and we've been playing terrible baseball. That's why we've lost a lot of games. Not because we haven't fought. Or because anybody quit." Eickhoff represented a rare September feel-good story — Kapler even called him "inspirational" — for the Phillies. He hadn't started a major-league game since Aug. 30, 2017, when he felt a tingling sensation in his right hand, and his injury odyssey continued this season with a spring-training upper back injury, more tingling in his fingers during a rehab assignment, and two cortisone injections in as many months in his right wrist. The Phillies reinstated Eickhoff from the disabled list on Sept. 1 and put him in the bullpen. After Zach Eflin suffered a strained oblique last week, Eickhoff took his place in the final turn through the rotation. "They didn't have to give me a start," Eickhoff said. "[General manager Matt] Klentak, the staff, this was not expected. I didn't take this for granted. This was a gift, an opportunity. I'm just so fortunate and lucky enough to be able to have it. What a day." Jorge Alfaro missed his fifth consecutive game with a right quadriceps strain, but Kapler said he's "very confident" that the rookie catcher will start one of the season's final two games. … It appears infielder J.P. Crawford (shoulder), right fielder Nick Williams (hand) and perhaps third baseman Maikel Franco (shoulder) will be limited to pinch-hitting duty over the weekend. … In a pregame ceremony, the Phillies honored infielder/outfielder Austin Listi and left-hander David Parkinson, recipients of the Paul Owens Award as the organization's minor-league player and pitcher of the year. … Aaron Nola (16-6, 2.45 ERA) will make the final start of his breakout season Saturday night.